'Somebody will need to blow the whistle, call the play to a halt, and convince all players that they belong on the same side of the goal,' says Shekhar Gupta. A fortnight ago, I was tempted to twist former British prime minister Harold Wilson's familiar line: A week is a long time in politics. I suggest, therefore, that a weekend is a long time in India's judicial history. We are talking about the January 12 weekend. That is because the four judges who brought their institutional and professional questions in public debate through a press conference said, when asked how this would affect the functioning of the Supreme Court, that they would return to the court and it would be business as usual. 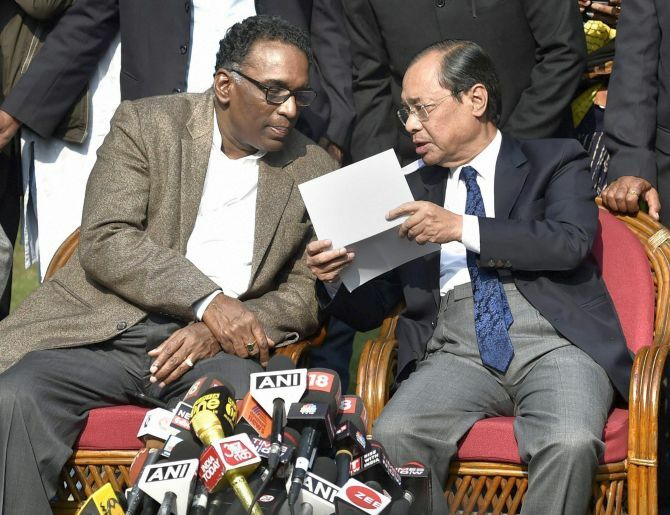 Much will happen before that -- behind-the-scenes conciliation efforts, political activity from all sides, and, most importantly, deep reflection by the four in front of us now, the Chief Justice of India, who must feel in the line of what he can see as fratricidal fire, and by the remaining 20. Remember that in our system all Supreme Court judges are equal. In the court, even the Chief Justice is just the first among the equals. Administratively though, he is in charge. That is where contentious issues rise. For it to be business as usual again, much give-and-take will have to take place between the two 'sides'. I use quote marks because it is unfortunate to describe two sets of our top-most judges as two sides. It is doubly unfortunate because, unlike the rest of us mortals who go to court hoping a judge with complete power over us will adjudicate on our dispute, the honourable judges have no such option. Who will judge the judges is an old and much misused line. But that isn't needed, either. This needs an older, fairer institutional mind to weigh in and address the issues. That 'uncle' figure doesn't exist anymore. Over the past two-and-a-half decades, the Supreme Court has ring-fenced, if not quarantined, itself within its own institutional confines. The law minister has very little say with them, at least not since the days of the Congress party's Hans Raj Bhardwaj, never mind that often his political guile ran ahead of his legal skill or stature. It is also unlikely that President Ram Nath Kovind, relatively new to the job yet, would have the weight to counsel the judges. But it is possible this has arrived as his moment to establish himself as a man of stature befitting the President of the Republic. Somebody will need to blow the whistle, call the play to a halt, and convince all players that they belong on the same side of the goal. In the Anglo-Saxon system we follow, the judicial practice is governed predominantly by precedents. In this case, unfortunately, no such is available. There have been supersessions and internal politics, victimisation for being a good judge and rewards for being a friendly one, especially in the Indira Gandhi years. Those years also gave us probably our most respected judge of all times: Justice H R Khanna. Never mind that he was denied his due to be the CJI. There have been strong disagreements within, but never like this, when everything has been sealed and confined within the Collegium for decades now. Nothing is transparent here, nothing is made public. No disagreements, dissent, why somebody is appointed a judge or why somebody is denied. Nothing. Nothing is put on the record. There is nothing for the citizens, nothing for Parliament and nothing for historians of future generations. The most senior judges in this omnipotent judicial club have had a vow of silence and secrecy. It wasn't broken until now. I am not willing to use an expression like omertà here even while adding a hundred words in qualification. Let's just say, it's been like, as we say, ghar ki baat ghar mein hee rehni chahiye (whatever happens within the household must remain here). This has now been broken, first by Justice Jasti Chelameswar, first in seniority after the CJI, and now by the other three as well. It was easy to understand where the judiciary was coming from when it fought the political class and gave itself the Collegium. Many of us (including this writer) have given the idea the fullest support over these contentious years. The logic was, whatever the system's flaws, it is better than having the political class mess with it -- because we did not want to end up with a disaster like the Central Bureau of Investigation and now various other agencies, over the years. In fairness, the judiciary has not disappointed us. When a big question of Constitutional propriety or liberty has come up, as most recently with privacy being a fundamental right, it has made the right calls. But, in the process, it has also shut itself out too tight. It is anachronistic in these times of hyper-transparency, including the live transmission of parliamentary proceedings, the Right to Information Act, and now large-scale hacks and leaked phone-taps, which the courts are repeatedly holding lawful. Over the years, the judiciary has become much too protective of this exclusive domain. Membership of the Collegium also became an indicator of rank. Any questions on its proceedings or demands of transparency were resented. Justice Chelameswar's revolt isn't out of the blue. He has been demanding openness in the Collegium, including the minuting of its proceedings. Denied, he had begun abstaining himself from its meetings until a while ago. The latest blowout is over the constitution of the benches to handle some 'sensitive' cases, now in the public domain and being discussed in detail. Justice Chelameswar called this a defining moment in Indian history. There are instances in our political history of one man's rebellion or action becoming a defining moment, striking at the power of an almighty leader or a comfortable government. Indira Gandhi was at the peak of her power when one high court judge, Justice Jagmohan Lal Sinha of the Allahabad high court, broke her momentum. Rajiv Gandhi was similarly hurt by the revolt of another individual, V P Singh. Would the United Progressive Alliance have lost as badly as it did in 2014 without then comptroller and auditor general Vinod Rai's defiance? In all fairness, part of that credit must also go to Justice G S Singhvi, who gave those firm judgments on the biggest scams, especially on 2G. The truth is, neither Justice Chelameswar by himself, nor all four judges who spoke on January 12, 2018 have that power to break the Modi government's momentum yet. Unlike Justice Jagmohan Lal Sinha, they aren't dealing with a case involving the government. Theirs, for now, is a battle within their own institution. That is why the government has been wise to stay out of it, at least as yet. Where this goes, and how it ends up now, will be determined by how the Chief Justice of India responds. Many of the cases in contention involve just the judiciary, like the medical colleges. What happens with them will matter, but only to the stature and respect of the judiciary. But there are others involving high politics. That is where Chief Justice Dipak Misra's wisdom will be on trial. How he exercises that will determine whether or not it is business as usual.